Sorry I'm still posting pumpkin recipes, but these muffins are just too good not to! 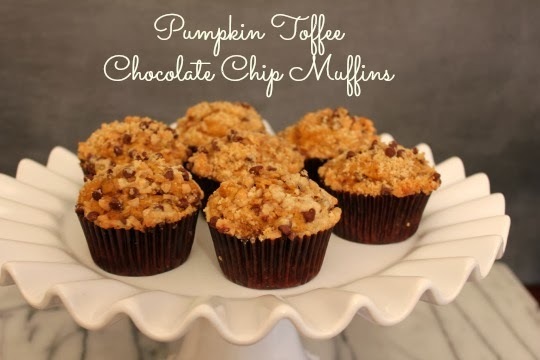 They combine three of my favorite things in baked goods - pumpkin, toffee bits and chocolate chips! 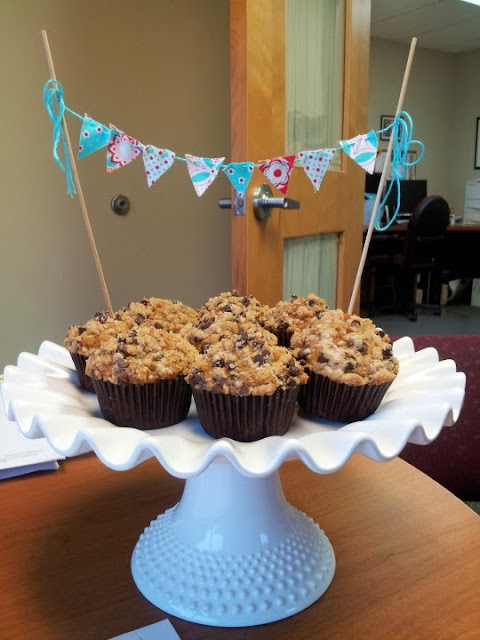 I decided to make these muffins for a special co-worker's birthday. She loves pumpkin, so I thought Pumpkin Toffee Chocolate Chip muffins would be perfect for her. I changed the recipe slightly by using half whole wheat flour and half all-purpose flour. I've gone a little crazy lately with the buntings, but they make things look so much more festive don't you think? In a medium mixing bowl, whisk together flour, spices, baking soda and salt. In a large bowl, combine the pumpkin, sugar, oil, eggs and vanilla. Stir until smooth. Add dry ingredients to the wet, stirring just until combined. Fold in toffee bits and mini chocolate chips. Using a cookie scoop, fill liners 3/4 full. To make the topping - combine all of the streusel ingredients into a small bowl. Using a fork or your fingers, combine until mixture is crumbly. Sprinkle one tablespoon over each unbaked muffin. Bake muffins for 20 minutes, or until a toothpick inserted comes out clean. You never have to apologize for making a pumpkin recipe! :) I found your blog through the Mixed Conference attendees and just wanted to stop by and say hello! I'm excited to meet in person next weekend! My blenders came!!!!!!! Thanks again SO much! We can't wait to go get stuff to make some smoothies!!!!!!!!!! Das Rezept ist super. Ich liebe diese Muffins.